Playing at Polkyth this afternoon. Cornwall were missing key players today, but the team fought hard nonetheless to match the Dorset side. Guy and Shane battled through a big three set game, winning 21-19 in the third to take the match to six games each going into the mixed. Sadly the Dorset team proved too strong in the final discipline, and took the three remaining games to win the match 9-6. A well earned, but disappointing single point instead of two for the table from Cornwall. Each event will be played on a round robin format, one end to 21, no extended play. Please return all entries by 9th February 2013 to Sue Cooper. Both entry forms can be downloaded here. 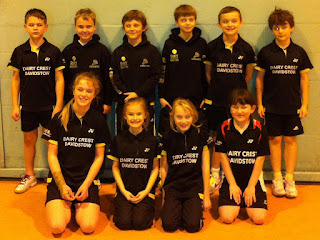 Cornwall under 11 badminton team lost to close neighbours Devon 27-9, in the second fixture of the season on 20th January 2013. As in the previous match against Avon, Cornwall fielded 3 of the required 6 under 11 girls and therefore conceded 12 rubbers automatically. However, Ellie Reed, Katie Phelps and Alice Pritchard from the Cornwall U13 squad kindly played to ensure a full team. The match provided debuts to Molly Pritchard and Ethan Walsh. The singles events provided some excellent match play and following several close games, Harry Dyer managed to win for the boys in the third berth. 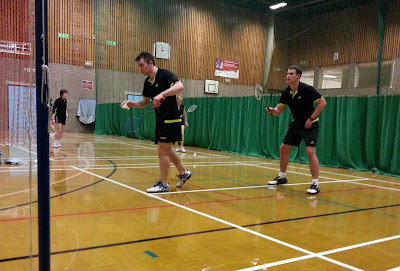 Ethan Walsh responded well to his first taste of county badminton losing in two close ends, despite only starting the sport in October 2012. Cara Collins and Charlotte Freer won their respective singles rubbers for the girls both in three ends. Building on a recent level doubles gold medal, Charlotte Freer and her partner Cara Collins continued their good form into the level doubles with all their rubbers lasting the three ends and successfully wining one rubber. Under 13 pairing of Ellie Reed and Katie Phelps won all their rubbers but unfortunately the games had to be conceded. Eight year old Molly Pritchard making her Cornwall debut played with her older sibling Alice and really responded well to the challenge with a positive attitude and the game play to match her smile. Building on their recent silver medal success, level doubles pairing William Freer and Harry Dyer comfortably won two rubbers with their determination and all round power play. The new pairing of Sam Hammersly and Adam Hobbs played exceptional well in all events, eventually wining one rubber. Adam really lifted his game and reaped the rewards for his hard work. Another new pairing consisting of the quickly improving Sam Phelps and Ethan Walsh, who both used their natural athletic ability to cover the court and play with great determination in all the games. These boys are really stepping up the standard. With the match won by Devon going into the mixed doubles, recent medal winners, the Charlotte and William Freer and Cara Collins and Harry Dyer combinations were both successful in their matches, comfortably defeating their Devon counterparts. Whilst Cornwall lost the match, the team has made significant progress since the last game and the team can feel encouraged for the final match against Dorset in March. Several players could have won the player of the match, but it was awarded to Cara Collins for her hard work and consistent game play in all three events. 13th Jan 2013 - Cornwall win 19/17! The Cornwall U13 team beat Avon 19-17 at home on Sunday 13th January. The singles events provided some close games. Avon Number 1’s and 2’s were strong, however, Amy Walker battled it out in her match lasting three ends, narrowly losing 21-19 in the third end. Charlie Standen and Nathan Holmes also played well taking their matches to three ends and winning. Consistent performances from Ellie Reed, Amy Grout, Maddie Ilsey and Charlotte Grigg, making her debut, meant we went into the doubles on a draw. Oli Cavill and Mark Pearson’s level doubles performance strengthened as the afternoon progressed, winning an important game in the third end 23-21. Other successful pairings winning two out of their three level doubles were Amy Grout and Maddie Ilsey, Sarah Frost and Amy Walker. We finished the level doubles 15-15!! The mixed doubles was a tense hour, but highlighted the strength and depth to our team. Luke Sillifant and Ellie Reed went on to win their third county mixed doubles match this season; a strong pairing. We managed to win 4 of the 6 mixed matches to beat Avon 19-17! Players of the match went to Mark Pearson and Amy Walker for their determined performance as a mixed pairing winning their match in the third end. The Badminton England Masters County Challenge, this year played over 2 days at Andover, consists of county teams from the south and south west in different age groups competing against each other in mens, ladies and mixed doubles. The over 45 team came 5th in their group, beating Middlesex and Suffolk along the way, with some great performances particularly from the dynamic duo of Lynda Beer and Jan Santillo who only dropped one game all weekend. The Cornwall over 60s team faired even better, led by Brian Hannibal, coming 3rd in their group and just losing out to Berkshire and Sussex this year. The team was Brian Hannibal, Phil Oland, Tony Roberts, Brian Gilbert, Vera Nancekivell, Pat Edwards, Celia Hilman, Linzi Crosswood. Another enjoyable vets weekend came to a close, after some mighty battles on the badminton court, and even better moves on the dance floor and in the hotel pool. 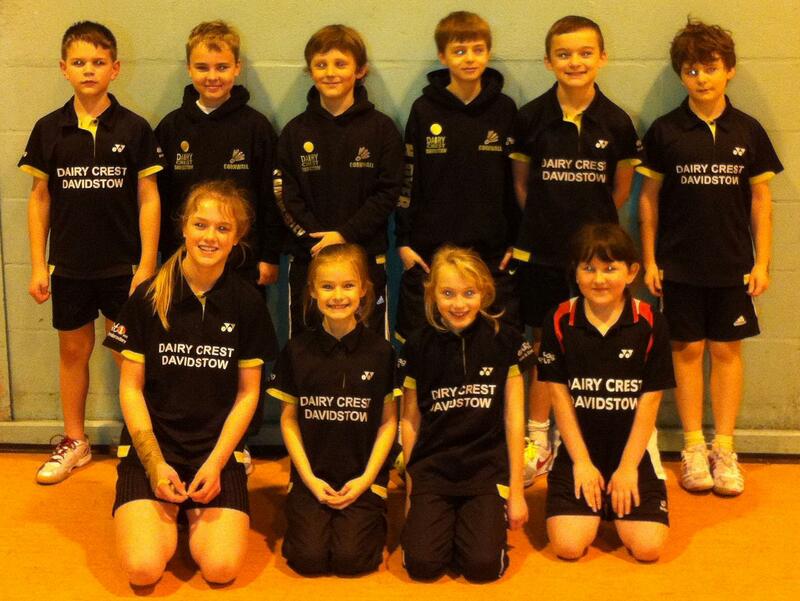 The U11 CORNWALL COUNTY CHAMPIONSHIPS will be held on Sunday 24th February 2013, at TRURO SCHOOL from 9.30am – approx. 4pm. Entries to be returned to Sue Cooper by the closing date of 9th February 2013. U11 Entry forms download here. The U13 CORNWALL COUNTY CHAMPIONSHIPS will be held on Saturday 2nd March 2013, at PENRYN COLLEGE from 9.30am–5pm approx. U13 Entry forms download here. Following the relative success of last years Newquay Cup Tournament, it has been decided to run the event again. This tournament is a Handicapped Mixed Doubles Tournament open to ALL players – League and Social. (The Social element of the tournament will not be handicapped as the Committee will not have the relevant info to handicap couples fairly). The format of the Tournament will be decided by the number of entries, but it will be a round robin. To be held at Newquay Sports Centre commencing at 12.00 mid-day sharp until 4.00pm. Entry fee £5.00 per person. Social Category : Eligible players must have only played recreationally within the last 10 years. Players who have played any league/county or similar standard matches within this time will be ineligible for this category. League Category: Eligible players who have played League or County, and who do not fall within the Social category. Entry forms are available here, and need to be returned to Lorna Riggs by no later than Thursday 31st January 2013. The newly formed Cornwall 3rd team travelled away this weekend to do battle with an experienced Isle of Wight 2nd team. Our Cornish team of 8 players, 7 of whom are U21 players responded well to the long trip by winning the fixture by a convincing 10 matches to 5, which is an excellent and well deserved result with every player contributing something to the day. The day started brilliantly with all 4 singles players, Imogen Crarer, Bethany Wotton, Christian Jasper & Chris Cooper, winning their matches. The womens doubles pairings of Bethany Wotton & Jane Barber and Imogen Crarer & Bethany Rich went onto consolidate the upper hand gained in the singles by winning all 4 of their matches with real spirit. The men’s level doubles with pairings of Lee Chapple & Sam Spencer and Christian Jasper & Chris Cooper fought hard against some tough Island opposition and took 1 of the 4 men’s doubles matches, with Lee & Sam clinching a tough and vital 3 end match to take the team score to 9 – 3 going into the mixed. With the match already won, it was important to get our score up to 10 matches and by doing so achieving the maximum 3 points from the fixture. The Isle of Wight made our task very difficult with some very spirited performances in all 3 of the mixed matches. It was with great delight that our pairing of Chris Cooper and Bethany Rich overcame their worthy opponents to get our score up to the magic 10 matches. Our 3rd team travel on the 20th January to play Guernsey 2nds at Crewekerne, Somerset and again on 27th January when we travel to Brighton to take on Sussex. Sunday 6th January 2013 saw the Cornwall under 11 badminton team lose to the Avon under 11 team 28-8 at St Ursula’s School, Bristol, in their first fixture of the season. Unfortunately, Cornwall only fielded 3 of the required 6 under 11 girls and therefore conceded 12 rubbers automatically. The match provided debuts to Sam Phelps, Adam Hobbs, Daniel Appleyard and Naomi Cavill. Avon had the rub of the green in the singles events and despite several close games, only Sam Hammersley and Harry Dyer won their rubbers in the second and third berth respectively. However, the level doubles provided much improved results with Cornwall’s number one pairs, William Freer and Sam Hammersley and Cara Collins and Charlotte Freer winning 2 rubbers each in thrilling matches with a high level of badminton on display. Harry Dyer was magnificent with debutant Daniel Appleyard beating their Avon number two counterparts in 3 ends with Avon having no answer to Daniel’s excellent serves and Harry’s consistency. With the match already won by Avon following the singles and level doubles events, the team managed to win 1 mixed doubles rubber with Harry Dyer and Cara Collins skilfully outpointing their opponents. Another notable performance came from Sam Hammersley and Naomi Cavill who narrowly lost 22-20. Whilst Cornwall lost the match, had we managed to field a full team, the match score could have been significantly closer. The debutants will have gained valuable experience in a most enjoyable day’s badminton. Katie Phelps, the Under 13 squad member, kindly travelled with the team and played to make up 2 doubles pairs, but her games were conceded. The player of the match was awarded to Harry Dyer for his consistency and fine performances in all three events. Cornwall County Badminton Association held their County U21 championships at Polkyth Leisure Centre on Sunday 30th December. There was a record entry of players and a fantastic display of very competitive and hard fought matches across all three disciplines – singles, level doubles & mixed doubles. The event was well supported by many players from the U15 & U17 squads of Cornwall Youth Badminton who showed both great talent and sportsmanship throughout the day. Hester Luke ( Mounts Bay BC) who beat Bronwen Wotton(First Edition BC) in the Ladies singles final. Lee Chapple (Mounts Bay BC) & Jack Dyer (First Edition BC) who lifted the Mens Doubles title from former champions Ross Lashbrook ( Launceston BC) & Sam Spencer ( First Edition BC). Ross Lashbrook in his final year as an U21 took an impressive brace of titles by retaining both the mens singles event by overcoming a very worthy runner up in Jake Brazwell (Newquay BC & Cornwall U17’s) and by holding for the 3rd consecutive year the Mixed Doubles title with his long term partner Bronwen Wotton. Ladies Singles: Winner – Amy Polglase (First Edition BC & Cornwall U15’s) RU Imogen Powell (First Edition BC) .